With spring in full bloom and summer on its way, there’s lots of talk about gardening in the air. 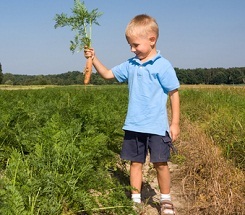 Growing a garden is a wonderful hands-on science activity for families. Kids can learn about seeds, plants and pollination. They can explore the course of nature. And many research studies report that children who are involved in growing and choosing their own foods are more likely to taste new foods with less of a fuss. What child doesn’t love to grow a flower that will be taller than they are by summer’s end! Sunflowers come in many varieties so that you can choose one that best fits your yard. Try growing then close to the house or a play set so kids can track their height each week (great hands-on math practice). Another fun activity is to take a weekly photo of your child standing next to the flowers. Once the flowers are mature, you will be able to harvest the seeds and eat them! Moonflowers can be fun to grow because they buck the typical gardening trends – they actually bloom in the evening and through the night! They can be grown in pots so you can hang them (which I would recommend as parts of these flowers can be toxic if ingested). Kids will enjoy their great smell and it’s always fun to see them open in the evenings (seriously, you can sit and watch them bloom!) They will also attract night flying insects if you have a bug-lover in the house. Planting a garden that attracts butterflies or hummingbirds can provide days of entertainment and nature observations all summer long. Butterflies and hummingbirds are usually attracted to colorful plants with certain scents. Purple coneflowers, lavender, zinnia should attract butterflies while columbine, hollyhock and delphinium are popular with hummingbirds. Growing vine plants requires that you have some room for them to grow, but you can also control their reach by allowing them to grow up a trellis or fence. Cucumbers, pumpkins, zucchini, and runner beans are great vine plants to try with the kids. First, the vines can grow quickly so kids don’t have to wait too long to see their plant get bigger. You can also create a fun hide-out for the kids as the plants mature. They also have larger flower buds that appear along the vine so if you have more than one child, they can each ‘adopt’ part of the plant. Most of the vegetables from these plants appear later in the summer but many times vine plants will yield a great crop well into the fall and kids will enjoy picking the items over the course of a few weeks. Growing herbs can be done both inside and outside. Our favorites include basil and cilantro. All herb plants have wonderful fragrances that kids will enjoy as they grow. To get the full effect of their smell, take a leaf off the plant and smell the stem. Herbs are usually quick growers and can be used in a variety of recipes, which should encourage kids to help in the kitchen and try a new dish!